Are you a Turbo C++ addict/? Learn how to emulate Turbo c++ with Dos-box in a few steps. Ubuntu's purple love-- A Clean and minimalistic wallpaper for your Desktop. Transform Windows keyboard to Ubuntu. 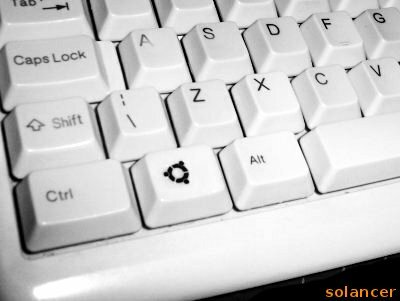 Why should there be a windows key on a Ubuntu computer ? This question has bothered many Linux users, so here´s what you can do. With a nail sandpaper, sand the top of the key until you see no image there (careful not to damage the key). Alternative: if you use a transparent nail polish on the key and remove it using acetone (after a while), the image can be erase easily. After remove the image, pass nail polish on the key. Print the image you want to put on the key on a normal sheet (i made it 0,6cm x 0,6cm). Pass transparent nail polish on both sides of the sheet over the image. The sheet will become a little “plastic”. Cut the image carefully, using a knife. Paste the image on the key (you may paste with the nail polish) and pass more nail polish to fix it and protect. The objective of this article is to help students to run Turbo c++ under Ubuntu (Linux) O/S. B.C.A students of Bangalore university find it quite difficult to cope up with the syllabus and learning at a very fast pace. This Site is licensed under a creative common rights NonCommercial-NoDerivs 3.0 Unported.